Los Angeles (AP) – The bean counter cometh! In Gavin O’Connor’s “The Accountant,” starring Ben Affleck, the paper-pushing CPA — roughly the exact opposite of Schwarzenegger or Stallone — gets his shot at action hero stardom. If we pull out our calculators, we can deduce that the odds of this are slim. Carrying the one and rounding up, you might even conclude that it’s a patently ridiculous premise. But “The Accountant” has much grander goals of implausibility. The film comes from a script by Bill Dubuque (“The Judge”) that, come tax season, may well be at serious risk of an audit. It’s about a secretive, autistic accountant for prominent criminals who’s a muscular, military-grade hit man by hobby, plagued by his father’s relentlessly militaristic parenting, who becomes embroiled in a robotic prostheses company’s bid to go public. You know, THAT old story. He has amassed the hidden fortune as an accountant for hire to drug cartels, money launderers and the mafia. His liaisons are set up by an unseen operative who communicates with Wolff only by phone. When it comes time to sift through documents, Wolff — like a pianist preparing for Beethoven — blows on his finger tips and dives in. He is, one client swears, “almost supernatural” in his ability to run numbers and smell out who’s cooking the books. “My boy’s wicked smart,” another Affleck bragged of Matt Damon’s mathematician in “Good Will Hunting.” Whereas Damon went on to play an assassin with amnesia in the Bourne films, Affleck’s equally lethal mercenary is distinct for his place on the spectrum. Filling the movie are flashbacks to Wolff’s childhood, when his army father (Robert C. Treveiler) refused to accept his autistic son’s differences. Instead, he raises him and his brother like soldiers, training them with specialists. It’s a quirky method of parenting sure to spawn a best-seller: less homework, more pentjak silat (the Indonesian fighting style). The origin story — complete with a bizarre but formative stint in prison with a cameo from Jeffrey Tambor — plays like a superhero’s. Many of the characters, too, feel straight out of a comic book: J.K. Simmons’ Treasury Department investigator, Jon Bernthal’s over-inflated enforcer, Anna Kendrick’s accounting clerk, the movie’s lone smiler. Affleck’s hulking, number-crunching CPA is no less severe than his Batman. The actor plays him deliberately flat, with an unrelentingly even voice and a dispassionate, anti-social blankness. As was the case in “Batman v Superman,” he’s better than the overcooked soup he’s swimming in. There are legitimate objections to be raised about a film like “The Accountant” treating the autistic like savants. But there are genuine gestures here about accepting the gifts of people with autism, and it’s worth noting how unusual such territory is for a Hollywood thriller — something O’Connor (“Warrior,” ‘’Pride and Glory”) knows how to firmly construct. “The Accountant” is, if nothing else, singular in lending an action-movie cliche an absurdly peculiar and elaborate backstory. “I like incongruity,” Wolff says in one scene. 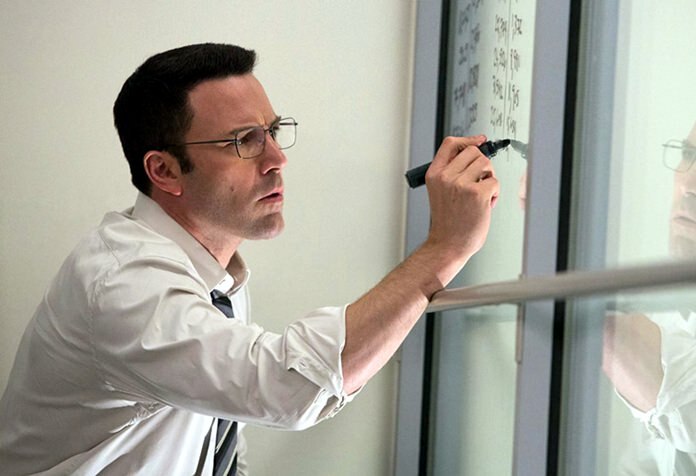 “The Accountant” does, too, but maybe a bit too much. “The Accountant,” a Warner Bros. release, is rated R by the Motion Picture Association of America for “strong violence and language throughout.” Running time: 128 minutes. Two stars out of four.